The nut trees native to South Carolina provide you as a homeowner with a shade species capable of producing edible nuts in many cases. These nuts, in addition, typically attract wildlife to your property. You should always consider the clean-up involved when using native nut trees in South Carolina for landscaping jobs, as most will have their compound leaves, nuts and their shells fall to the ground after the growing season. The black walnut (Juglans nigra) has many attractive features, including a dark bark with fissures and ridges that create a "diamond pattern," according to the Missouri Botanical Garden. Native to the northwestern half of South Carolina, black walnut grows to 125 feet in perfect scenarios, but usually is less than 100 feet. The tree has compound leaves featuring a central stem up to 2 feet long with as many as 23 leaflets arranged opposite each other on it. Black walnut produces toxins known as juglones from its root system. These poison certain types of plants and prevent them from developing near the tree. Avoid planting species including rhododendrons, azaleas, peonies, and blueberries near black walnut, as the juglones will wreak havoc with them. Black walnut succeeds in full sun habitats. Floridata describes pignut hickory (Carya glabra) as eastern North America's most common hickory species, and one of the smallest. However, this tree can still reach 100 feet, with most between 60 and 80 feet. The tree grows throughout the Palmetto State in partly shady and fully sunny locations. Pignut hickory features a compound leaf with from five to seven leaflets. The leaves change to yellow no later than October, providing some fall color. Pignut hickory's nut is edible, protected by a dense shell that will break open at its base once the nut ripens. However, the nut is bitter and probably better suited as nourishment for birds, squirrels, foxes and chipmunks. Pignut hickory's smooth brownish-gray bark is an attractive feature. The elongated taproot of the pignut hickory makes it problematic to transplant, somewhat limiting moving one to a desired location. Consider leaving those in place when home construction begins alone to continue growing. Eastern South Carolina is within water hickory's (Carya aquatica) native range. As its name implies, this nut tree grows near water, typically close by to streams and swamps or in river floodplains and lowlands. Use it on those sites where the ground is damp, but not saturated all the time. Water hickory, which grows to 100 feet, prefers partial shade. Water hickory is an important tree for creatures such as ducks, squirrels and wild hogs – all eat the nuts that fall from its limbs. Water hickory possesses as many as 17 individual leaflets on its compound leaves. The trunk usually grows straight and the branches form in an upright position from it. The nuts are very bitter, rendering them inedible by humans, notes the "National Audubon Society Field Guide to Trees: Eastern Region." 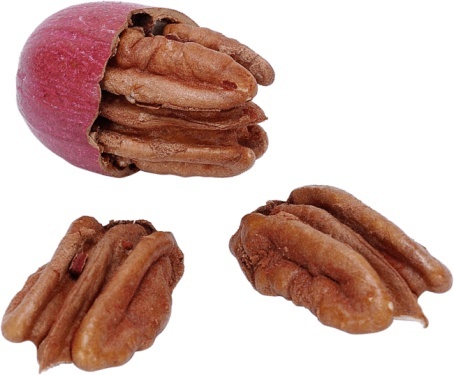 Why Does My Pecan Tree Produce Rotten Pecans?